Why is it important to get training from a Solar Training School? Safety is the first and foremost reason for Solar Training. A well trained installer will employ workplace safety practices established by the Occupational Safety and Health Administration (OSHA) and the National Fire Protection Agency’s NFPA 70: National Electrical Code. The safety of the installer and a safely installed photovoltaic system is a key element to the progression of this evolving PV industry. What types of schools are there and what kind of programs do they offer? What are the pro’s and con’s of the different programs offered, for example; hands on vs. online training? There is no substitute for hands on or on the job training for an installer, It’s a must do. The problem with most hands on courses offered is the cost of the training, ranging from $1000 to $ 3000 for a 5 day course. Other issues are the cost of travel, being that most facilities are remotely located and the cost of lodging , if available . Online training is defiantly the green choice for training. There is no commuting, (reduction of co2 emissions) and a reduction in the use of paper and other consumable products. The classroom portion is the same offered by hands on schools. Online training is ideal for solar careers that do not rely on the hands on aspect of installations. Is there an industry standard of accreditation, certification and licensure? There are several accreditation organizations for renewable energy education providers. The Institute for Sustainable Power is the industry’s most recognized. Solar Training School has modeled its curriculum and business practices around the ISPQ International standard’s core requirements. At present time no states require certification for installers and few states require renewable energy licensure . The North American Board of Certified Energy Practitioners (NABCEP) offers installers a certification that is voluntary , not mandatory. What content should one look for in a quality program? The course should include electricity basics, solar radiation, system components, system design and economic analysis. Make sure the course content and learning objectives are clearly defined. Quizzes and testing should be implemented for material comprehension and retention. Is there lots of demand for trained solar installers today? The Renewable Energy sector is the fastest growing in our re-emerging economy. When the need for clean green energy explodes well trained installers will be in great demand. There is concern in the education sector of over training installers and flooding the employment market. Solar Training School’s course is designed for installers and other solar career opportunities. What types of careers are available in the industry? The industry is rapidly growing and changing from a mom & pop installer that used to do it all, to an industry that has evolved into big corporate business that has sectored out and is highly specialized. Some job titles include; Integrator, (A business that designs, builds and installs complete PV systems) Installer, Site assessor, Design and Engineering, Sales, Maintenance personnel, Distributors, Manufacturers, Inspectors and Code Compliance officials and of course Trainers and Educators. Where and what types of jobs are in demand? The types of jobs and job titles are too numerous to list. Most businesses in the industry have jobs posted on their websites. Many organizations and associations have employment opportunities . Another great source is the American Solar Energy Association (ASES) they have a Jobs page on their website with many career opportunities listed. How does quality solar training affect workforce development. A well trained solar workforce is necessary to ensure quality installations that are safe, astatically pleasing and operate to consumer’s expectations. Cost reductions through-out the industry including reduced cost of systems due to industry competition. Insurance rates for integrators will also be reduced due to less workplace miss happenings . Consumer confidence will also increase if industry representatives are professional, well informed and trained properly. Tell us a little bit about Solar Training School. Solar Training School specializes in Online Photovoltaic Education, focusing on Design, Installation, and Operation and Maintenance of Photovoltaic (PV) systems. The classes emphasize safety, industry insight and workforce development. The course is appropriate for individuals seeking entry level employment in the renewable energy or green collar industry. The training is presented online with live instructor support. Students receive 20 hours of lecture, discussion and interaction with the instructor and other students. Informative PowerPoint and Multimedia presentations are incorporated into the online classes. Students will participate in online quizzes and testing for better comprehension and retention of material. Upon registration of class the student will receive a Photovoltaic Systems textbook, an interactive CD-ROM and a Photovoltaic Cell. The textbook is the solar industry's premier reference and used by the National Joint Apprenticeship and Training Committee (NJACT). The CD-ROM brings the textbook to life and includes an illustrated glossary, forms and worksheets, solar radiation data sets, sun path charts, solar time calculator and other reference material. A small operational photovoltaic cell is included for hands on lab exercises. 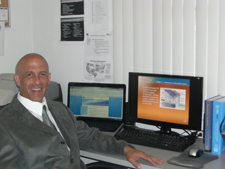 Gene Schlesinger is a successful entrepreneur and the founder of Solar Training School. Gene started his solar career in 1985 as a solar thermal installer. He is a consultant to manufacturers, distributors and companies desiring to enter the solar industry. Gene is also the founder and developer of the following; Lion’s Roar Kung-Fu Academy, InfoServ,(pioneer of online investigations) American Process Service (Legal support services). Solar energy is truly a labor of love for Gene and it shows through his passionate efforts and actions to promote and educate renewable energy to the general public.